Austria (German: Österreich; officially called Republic of Austria), is a country in Central Europe. Around Austria there are Germany, Czech Republic, Slovakia, Hungary, Slovenia, Italy, Switzerland, and Liechtenstein. Currently, the chancellor is Werner Faymann. 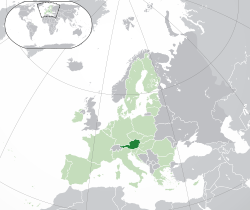 Austria has been a member-state of the EU since 1995. The people in Austria speak German, a few also Hungarian, Slovenian and Croatian. The capital of Austria is Vienna (Wien). Austria is more than a thousand years old. Its history can be followed to the ninth century. At that time the first people moved to the land now known as Austria. The name "Ostarrichi" is first written in an official document from 996. Since then this word has developed into the Modern German word Österreich. Austria is a democratic state and has nine federal states (German: 'Bundesländer'): Vorarlberg, the Tyrol, Salzburg, Carinthia, Styria, Upper Austria, Lower Austria, Vienna and Burgenland. It is a neutral state, that means it does not take part in wars with other countries. Austria has been in the United Nations since 1955 and in the European Union since 1995. There has been human settlement in the area that is now Austria for a long time. The first settlers go back to the Paleolithic age. That was the time of the Neanderthals. They left works of art such as the Venus of Willendorf. In the Neolithic age people were living there to dig for mineral resources, especially copper. Ötzi, a mummy found in a glacier between Austria and Italy, is from that time. In the Bronze Age people built bigger settlements and fortresses, especially where there were mineral resources. Salt mining began near Hallstatt. At that time, Celts began to form the first states. The Romans came 15 B.C. to Austria and made the Celtic Regnum Noricum to a province. Modern Austria was part of three provinces, Raetia, Noricum and Pannonia. The border in the north was the Danube. Austria was the Austrian Empire from about 800 to 1918 and was ruled by The House of Habsburg for most of that period. Then it became a republic. The First Republic was from 1918 to 1938. From 1938 to 1945 Austria was part of Germany. The Second Republic was started in 1945. Austria is a largely mountainous country since it is partially in the Alps. The high mountainous Alps in the west of Austria flatten somewhat into low lands and plains in the east of the country where the Danube flows. Many famous composers were Austrians or born in Austria. There are Wolfgang Amadeus Mozart, Joseph Haydn, Franz Schubert, Anton Bruckner, Johann Strauss, Sr., Johann Strauss, Jr. and Gustav Mahler. In modern times there were Arnold Schoenberg, Anton Webern and Alban Berg, who belonged to the Second Viennese School. Austria has many artists, there are Gustav Klimt, Oskar Kokoschka, Egon Schiele or Friedensreich Hundertwasser, Inge Morath or Otto Wagner and scienc. Famous Austrian dishes are Wiener Schnitzel, Apfelstrudel, Schweinsbraten, Kaiserschmarren, Knödel, Sachertorte and Tafelspitz. But you can also find a lot of local dishes like Kärntner Reindling, Tiroler Knödl or Salzburger Nockerl. ↑ World Factbook (3 August 2010). "Austria". CIA. https://www.cia.gov/library/publications/the-world-factbook/geos/au.html. Retrieved 14 August 2010. ↑ "Bevölkerungsstand und −veränderung". Statistik Austria. 2011-05-19. http://www.statistik.at/web_de/dynamic/statistiken/bevoelkerung/bevoelkerungsstand_und_veraenderung/056447. Retrieved 2011-07-24. ↑ 3.0 3.1 3.2 3.3 "Austria". International Monetary Fund. http://www.imf.org/external/pubs/ft/weo/2012/02/weodata/weorept.aspx?sy=2012&ey=2012&scsm=1&ssd=1&sort=country&ds=.&br=1&c=122&s=NGDPD%2CNGDPDPC%2CPPPGDP%2CPPPPC&grp=0&a=&pr.x=74&pr.y=5. Retrieved October 2012. ↑ "Human Development Report 2011". United Nations. 2011. http://hdr.undp.org/en/media/HDR_2011_EN_Table1.pdf. Retrieved 8 November 2011. This page was last changed on 24 July 2015, at 07:58.